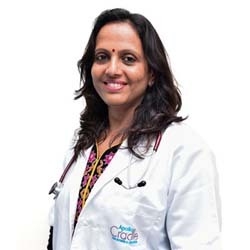 Dr. BM Mamatha is an Obstetrician and Gynecologist having 25years of experience.She started her career as Resident at Bangalore hospital and St.Marthas Hospital.Currently she is a Visiting Consultant at Apollo Cradle Koramangala .Specialized in handling High risk Obstetric cases,Infertility cases,Routine antenatal and post natal and well women clinics. Excellent consultant – Mamatha B.M. has given the best of service. Very cheerful and charming nurses. Very helpful and patient with the babies and the fussy mommy like me. Good physiotherapist and dietician. Very helpful and supportive. I gave my first baby birth in Cradle Koramangala. Entire team was excellent and no hospital can be better than this. Special thanks.